There’s only one way to get onto Cape Breton Island (assuming you don’t have a boat). The Canso Causeway connects mainland Nova Scotia with its northern island. And while Cape Breton is probably the most beautiful part of Nova Scotia, its entryway is downright underwhelming. Some might even say ugly. There, I just did. But don’t let that discourage you — there’s still plenty of beauty up ahead. 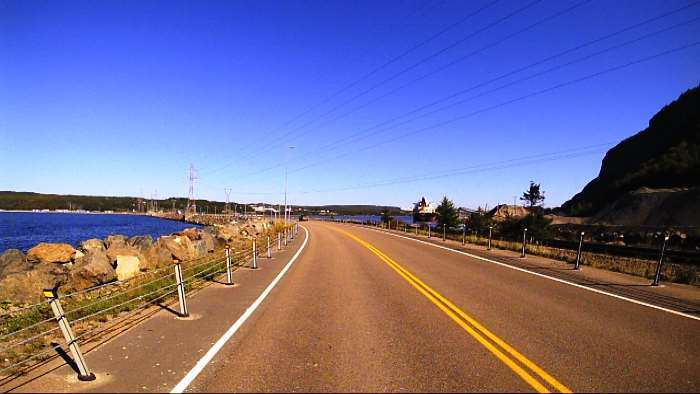 Trans-Canada Highway 104 crosses the Canso Causeway, connecting the mainland to the island. It’s a two-lane road at this point. On the Cape Breton side of the bridge, you have your choice of Route 104, 105, or Trunk 19. I had been planning trips to Cape Breton Island for years. The promise of a scenic drive around the Cabot Trail and hiking in the mountains of Cape Breton National Park always seemed like a great vacation idea. But, Cape Breton is a long drive from the U.S., and thanks to the distance, the international crossing, the price of gas in Canada, and a host of other reasons, my repeated attempts at planning a Cape Breton trip fell apart. So when I finally arrived in 2016, I was really excited to finally be crossing over onto Cape Breton Island. And then I realized, the grand entrance to this great place is somewhat unrefined, industrial, and dare I say it — ugly. I didn’t stop as I crossed the Canso Causeway in either direction – arriving on the island or leaving it a few days later. These blue-sky pictures are from my departure, shot by the roof-mounted Drivelapse cameras. The first shows the northbound approach to the causeway. Here, you’re in the town of Auld’s Cove, where the Porcupine Mountain Quarry provides a lot of jobs. It also makes the base of Porcupine Mountain (at the south end of the causeway) look like a construction zone. … the Canso Canal Bridge. This rotating bridge allows boats to pass through the Canso Canal, providing quicker access to the Atlantic Ocean. The bridge includes a “Welcome to Cape Breton” greeting, but there’s nothing picturesque about this bridge. Here’s what it looks like on a cloudy day. This is from my arrival on Day 4. Just after you arrive on Cape Breton Island, there’s a welcome center and parking area, where you can take a look back on the Canso Canal and Causeway. After that, you’re ready to start thinking about what’s up ahead — a much more attractive island. You’re going to have an excellent time on Cape Breton Island, and it’s going to be beautiful. Just get over the causeway and move on to better places.